Important: Most of the custom ROM will not have Google Apps in them. So, you will have to download and install GApps manually. Let’s see how to flash a lineage os rom on any Android device using TWRP recovery. 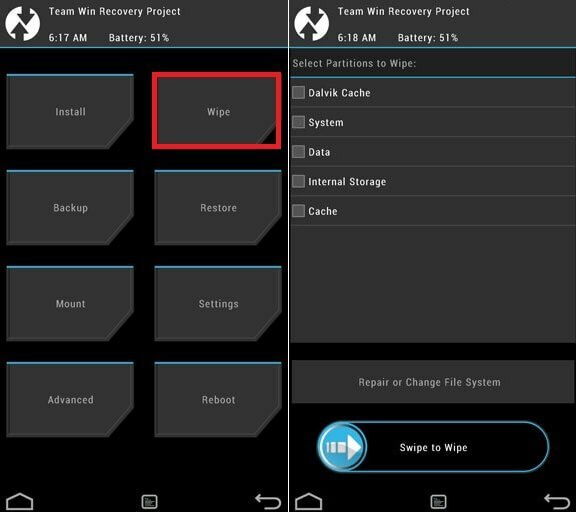 see also: How To Flash / Install GApps Via TWRP Recovery? Download and transfer the Lineageos ROM and Gapps for linage os you wish to flash to your device’s storage. Go back to TWRP main menu, tap on “Install” and select the Lineage os ROM .zip file and gapps for lineage os that you transferred to your device in Step 1. Second methods of installing lineage os rom is via CWM recovery. I you are having CWM recovery then you can follow below step to install it. Lineage os rom, Modaco, AOKP, Slim ROM, MIUI. There are many other ROMs for different Android devices. You can choose the one that suits your needs the best. Step 1: Download the ROM zip file and copy it on root of the SD card of your device. Also copy the GApps zip file, if you want to install Google Apps too. You are now in CWM recovery more. Use volume keys to navigate up & down and use Power button to select an option. Now select “Backup” to start the nandroid backup process. After backup is done, navigate back to main recovery screen. Step 4: Now select “wipe data/factory reset” option. When it asks for confirmation, select “Yes” to confirm data wipe process. Then navigate back to main recovery. The custom ROM installation will now begin. Wait for it till its complete. Note: If you copied any other zip file alongside the ROM file (like GApps zip), repeat the above steps to install that zip file. Step 6: After installation is complete, navigate back to main recovery screen and select “reboot system now” option to reboot your device. Your device will now reboot. Please note that first boot may take some time, so be patient and do not interrupt the boot process. When it boots up, your device will have custom ROM installed. Same steps can be followed to install any zip file like Google Apps on your device. Does it work For Galaxy S5 mini G800F? Yes it will work ! "An old cheap smartphone with decent enough camera that would boost its potential if you made it a Custom ROM, despite it being a cheap phone. It has Unofficial CM11 on xda"
There's a rom to Galaxy J2 (J200BT)? If not, please do it. Btw, some options on the developer options doesn't save or stay after Reboots... I hope it can be fixed on Lineage OS if this is a bug... for example the Disable HW Overlay, I need it to stay disabled on developer options because "some" videos being played on MX Player would flicker zooming in or out a bit, when paused and disable hw overlay can fix it. Galaxy Note 3 n900 Exynos ha3g please. I want Leneage Os 14 For Xperia Z3(Dual)Plz. Hi? Why i don't see ability update rom through WI-FI? when will Asus zenfone 2 ze550l will get the update?? Hello and good luck for the new project. I have a ZTE Blade A512. Cheers and thank you for any info. Need for umi Z when it releases. why does the camera not work on my HTC m9 after installation of Lineage OS? i have TWRP and ROOT access. i downloaded the lineageos 14.1 and Gapps arm 7.1 aroma for Huawei ascend mate 2 and my bootloader is unlocked. i did factory reset then wiped david, data, system and cache, then tried to install lineage and i got an ERROR 7. what is the problem? I have ClockworkMod v6.0.1.2 installed, and also had CyanogenMod 9 installed, on a Xperia Arc S. Now I am trying to install Linage OS 14, but that does not work. What is wrong? Is my CWM to old? Warning: No file_contextsE3004: This package is for device LT18i,Lt18a,LT15i,LT15a.anzu; this device is . as you wish about OTA installation,, it can be updates not clean installation, (I think) Its NOT Possible, Because if Clean installation from OTA, it need connected to any Services Like GSM, WiFi, But its Not. i wiped the dalvic cashe before installing lineage. its been 3hrs the installation is going on.... any suggestions? Hi, I managed to flash LineageOS but then I had no back option so it rebooted,and no I have no recovery mode and no Gapps... Any way to fix this? VK800x (Chinese Phone) will work? How to Update Lineage rom ??? is root necessary to install LineageOS custom rom? does Lineage os supports volte ??? sm-n900 flashed the lingage rom, sim card and wifi not work, how to fix? Dose LineafeOSwork on Oppe R7 Lite ??? Hello, i'd like to know if LineageOS support Xposed, modules including? I installed GApps according to what I believe were the correct instructions, but it says that it is incompatible. I am using a Moto X Pure (which is ow running Lineage). Can you help me out? Does it work on Samsung galaxy ON5? ?